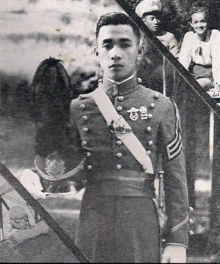 Ramon Alcaraz as a Philippine Military Academy cadet. Wikimedia Commons. Ramon A. Alacaraz or “Monching” to friends was born on August 31, 1915 in Plaridel, Bulacan, He entered the cadetship at the Philippine Military Academy on June 15, 1936 and received his commission as a 3rd Lieutenant on March 15, 1940. Ka Monching was one of the 79 new officers from the PMA. A year and half after the PMA, he would be integrated into the US Army Forces Far East (USAFFE) and assigned to the newly created Off Shore Patrol (OSP) of the Philippine Army. Then Commonwealth President Manuel L. Quezon contracted the acquisition 36 units of fast motor torpedo boats of British design as part of the off shore defense of the Philippines amidst the growing fears over an expansionist imperial Japan. The OSP was formally organized on February 9, 1939 with headquarters at the Muelle del Codo at the Port Area in Manila under the command of 1st Lieutenant Jose V. Andrada. The OSP, the forerunner of the Philippine Navy was assigned with three units of US Navy motor torpedo boats or Q-Boats (Quezon-boats); Q-111 “Luzon,” Q-113 “Agusan” and Q-112 “Abra” which was captained by Alcaraz. Upon the outbreak of the war, as commander of the Q-112 Abra, then boat Captain Alcaraz shot down three Japanese dive bombers zigzagging at the straight between Bataan and Corregidor island. Alcaraz and the Abra crew’s initiative stopped the Japanese from completing their objectives. Gen. Douglas McArthur promoted on the spot Alcaraz on January 1942 at Corregidor for heroism and gallantry in action. Alcaraz would later get captured by the Japanese and imprisoned at the Malolos, Bulacan Prisoner of War camp. Ka Monching was released by the Japanese on August 10, 1942 after undergoing months of intensive “rejuvenation program.” He was paroled and instructed to be re-trained at the Torres High School in Gagalangin, Tondo to join the Bureau of Constabulary. Graduating in September 1942 as a commissioned police officer, Alcaraz was told that his first assignment was Lanao del Norte. He faked a malaria illness resulting to his confinement at San Lazaro. Ka Monching missed the boat to Mindanao and was later re-assigned to Bayombong, Nueva Vizcaya. In the mountains of the Sierra Madre, he would clandestinely meet with guerrilla leaders under the command of Lt. Col. Manuel Enriquez. Though a middle ranking officer of the police reporting directly to high ranking officials of the Japanese kempetai, Alcaraz was clandestinely forming his network of informants against the occupying forces. All throughout the occupation period, Ka Monching gave the Japanese forces a false sense of security, gathering information and informing USAFFE Headquarters in exile up to the right time to fight came to light in the liberation of the Philippines in 1944. Alcaraz would continue to serve the defense establishment even after the war and upon instructions of then Defense Secretary Ramon Magsaysay, Commodore Alcaraz was instructed to study the organization of the United States Marine Corps. He would later use this learning experience to designate Philippine Navy personnel to form the First Marine Company under the command of his Q-Boat Executive Officer, Lt. Cdr. Manuel Gomez. The company would be based at the Marine Station at Port Area, Manila and eventually grow, becoming the present day Philippine Marine Corps. The Commodore last served as head of the Naval Operating Forces until his retirement on January 22, 1966. Alcaraz received multiple decorations in the course of his service in the Armed Forces. Among the awards and decorations include a Gold Cross, the U.S. Silver Star, Philippine and American Defense Medals, World War II Victory medal, Philippine Independence medal and others. He left for the U.S. when Martial Law was declared to continue with the fight for the rights and benefits of Filipino veteran soldiers who fought alongside U.S. forces in World War II. On June 25, 2009, Ka Monching peacefully passed away at the age of 94 at his home in Orange County in California. A 1940 pioneer graduate of the Philippine Military Academy, which was patterned after West Point by two great Americans — Douglas MacArthur and Dwight D. Eisenhower — Alcaraz is an authentic war hero. He was promoted on the spot and decorated personally by General MacArthur in Corregidor for heroism and gallantry in action in January 1942. He had shot down three Japanese dive bombers as Captain of a zig-zagging “Q” (torpedo) Boat in Manila Bay facing Bataan and Corregidor. As a result, the war planes failed to bomb their shore objectives. After graduation, he joined the OSP, bassinette of the Philippine Navy and became the Captain of Q-112, one of the 3 torpedo boats the Philippines had. He saw gallant action during WW II under the direct command of MacArthur and was awarded the Silver Star for shooting down 3 low flying Japanese planes off Bataan in Jan.17, 1942. He also won a field promotion. After the fall of Bataan, he became a POW and was interned in Capas. After his release as POW, he joined the guerillas in Bulacan where he became a Regimental Commander. After the war he rejoined the OSP and helped in building a new and bigger navy. He organized the Marines in 1950 on orders of the then defense secretary Magsaysay. He held various key positions and was promoted to Commodore, the highest navy rank in 1965. In 1966, when Marcos became President, “Parron” (one of his nicknames) was relieved summarily as Fleet Commander. A controversy on the issue of honor was raised by Alcaraz. It escalated into a Congressional Investigation which cleared him of any wrong doing. Afterwards he asked to be retired. After retirement, he and his pharmacist wife, Conching, whom he married in 1960 established a chain of drug stores they called Commodore Drug. Commodore Ramon Alcaraz , War Diary of Ramon Alcaraz (sourced from mirror of Geocities site as of 1999: however, the January 1942 entries are unavailable). Occasionally, the entries seem to have postwar annotations (within the entries) and notes (either after a particular parapgraph, or after the entries) by the author; we have reproduced these in italics although the original did not make any such distinction in many cases when made within a particular sentence; they are an editorial judgment on the part of this blog’s editors.